Prof. Nihar Ranjan Beura, Faculty (COE-SAP Lead), School of Management represented KIIT at SAP Academic Conference, Asia Pacific Japan 2012 held in Hong Kong during 3-7July 2012. 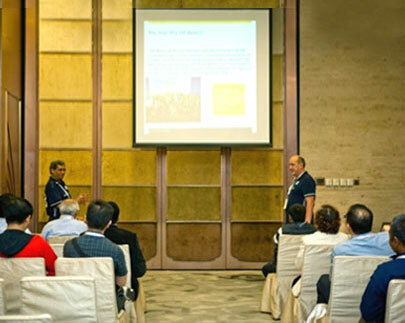 Nearly two hundred professors from various SAP University Alliance member institutes from over 21 countries participated in the week-long event. Besides KIIT, several reputed Indian Institutes like IIM, SIT, IMI, BITM, SIM participated in the conference. Participants took the opportunity to learn and interact with professors from other member schools and gain greater insights on SAP and the offerings by SAP University Alliances. Prof. Nihar also attended the SAP Cloud based solution for SMEs called SAP Business By Design certification course and became ninth in the region and third in India to achieve SAP Business By Design certification. He is the only SAP faculty amongst all sixty two member Institutes of SAP with rich ERP-SAP implementation experience in various Industries across the Globe.